Taiwan was and still is a sizeable market for Hong Kong's cinematic output. In turn, Taiwan's own genre film industry provided cost-effective B-fodder for Hong Kong distributors to dub into Cantonese or (badly!) into English, repackage and on-sell to domestic and international markets. As a result, you'd think most Taiwanese films were from Hong Kong, if a little rougher round the gills, strangely familiar and yet with a hint of something not quite right. Then there are Taiwanese genre films – and Wolf Devil Woman is only one example – which appear out of a bizarre alternate universe, are let off the leash and are currently howling and tearing off into the distance. Be prepared. 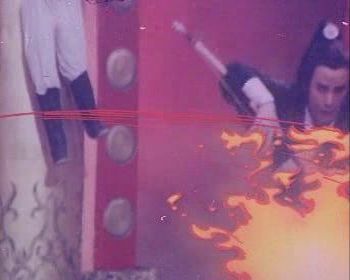 There was a noticeable shift in Hong Kong films in the early 80s from the more traditional kung fu cinema to more fantasy and horror-based stories. 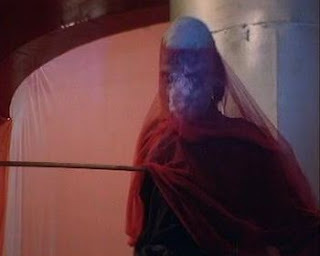 Tsui Hark's Zu Warriors From Magic Mountain (1983) for instance eschewed straight combat for high-flying wirework, supernatural elements , and some jaw-dropping leaps in internal logic. Other Asian film markets followed Hong Kong's lead, and Taiwan's skewed attempt from director and lead actress Pearl Cheung aka Chang Ling, could be one of the craziest of them all. 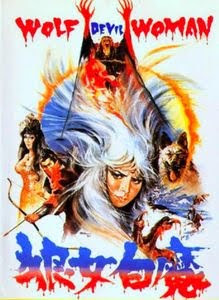 Wolf Devil Woman, also known as Wolfen Ninja, plunges straight into a crucifixion scene in some psychedelic Chamber of Horrors. It's presided over by a black magician who calls himself “The Devil”, a strange cartoon-voiced villain in gold lame and a KKK Grand Wizard's peak, and who has the ability to freeze his victims and keeps an army of zombies inert using voodoo dolls skewered with gold needles. Steel Sparrow, one of The Devil's minions, escapes the Ken Russell vision of hell with his wife and baby daughter into a snow-filled Purgatory; cornered by the Devil's satanic ninjas, the couple drench their daughter in their own blood and bury everyone alive in an avalanche. The baby girl is dug up by a pack of wolves and adopted by White Wolf, nurturing her into a bouncing young lady (the enthusiastic Pearl Cheung who's clearly having even more fun than her audience). She's a wild card alright, with a predilection for wearing a child's stuffed dog toy on her head and tearing live rabbits apart with her bare hands. Into the White Wolf's domain comes young buck Rudolph and his yokel Sancho Panza named Rudy, searching for a thousand year old Ginseng flower to restore his family's court from the Devil's freezing spells. Rudolph clasps eyes on Wolf Girl and it's love at first sight, and before too long he becomes a Professor Higgins to Wolf Girl's Eliza Doolittle when he should be clamping a muzzle on her out-of-control yapping (“It's not true!” she howls when she discovers White Wolf has been skewered on a tree. “It's not tarooooooooooo!”). When Rudolph is tempted across to the Dark Side, Wolf Girl (renamed “Snow Hibiscus” by zen poet Rudolph Higgins) grabs her wolf-claw nunchukkas and leaves her snow world, swinging from tree to tree like a lupine Tarzana, to redeem both Rudolph and her parents' deaths, to rediscover her humanity AND divine nature, and to note that satanic ninjas can be torn apart as easily as rabbits. Halloween masks, hopping zombies, rubber spiders: Wolf Devil Woman, along with its two in-name-only sequels, is a garish sugar overload of Taiwanese weirdness, played as much for cheap yukks as for the over-the-top shocks, and its pointless wirework and crude Eighties effects, all in glorious analogue 2-D! In order to watch these with optimum results, you'll need to construct a pair of 2-D glasses with clear cellophane over the left eye, and clear cellophane over the right. Now, take a bag of sugar...Oh no! Too much sugar! WOLF DEVIL WOMAN!! !